The webinar will present an introduction to HVDC by identifying the issues that must be addressed to successfully plan and operate an HVDC facility. Considerations for HVDC applications will be discussed along with some of the special physical and commercial challenges that must be overcome, including systems with deregulated markets. 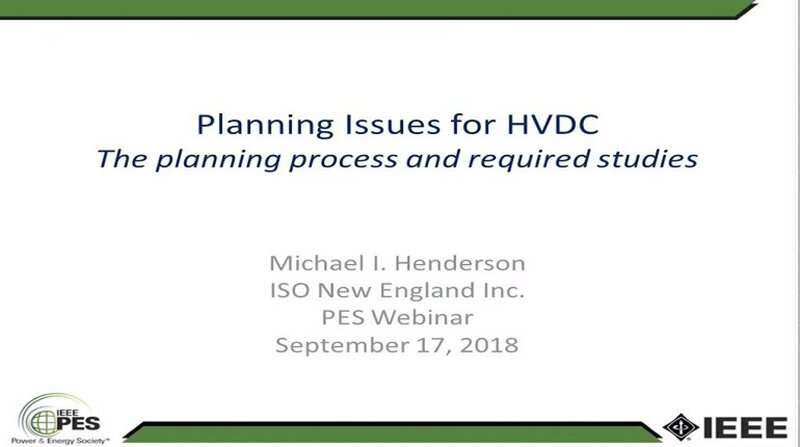 The webinar reviews the planning process and discusses the studies necessary for applying HVDC technologies. Attendees will understand: the role HVDC plays and why it will likely grow in the grid of the future. The planners perspective of the technical issues that must be properly considered and addressed to successfully plan, implement, and operate an HVDC project, and lessons learned from a few case studies of HVDC facilities. The long term considerations of providing reliable and economic service will also be presented, such as the lifetime costs of HVDC that must be considered when evaluating the economics proposed plans.